Orthodox vestments are a handy portal into the past. Love of tradition has made change difficult. 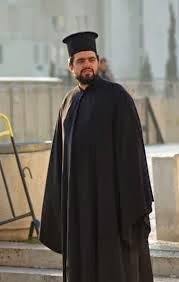 The Greek laity may be happy to follow every new fashion trend as it appears, but so far they prefer that their clergy wear cassocks that would have been commonplace on any street in Constantinople a thousand years ago. I refer of course to the cassocks, the rason, and exo-rason, the two non liturgical garments worn every day by deacons, priests or bishops . The exo-rason along with the black hat, the kalimafi, has become iconic of Greece. The Rason is also called an Anteri. It is worn under the Exorason, and is a somewhat form fitting floor length garment with a cloth or rope belt at the waist and sleeves like shirt sleeves. It was common to clergy and laity in Byzantine times. In Greece the rason is often blue or grey. The Exorason (in the first picture above) is black, the same linen over-garment that monks began to wear in the 800s to protect themselves from the elements. It is loose fitting and floor-length . It has to be loose to fit over the rason. 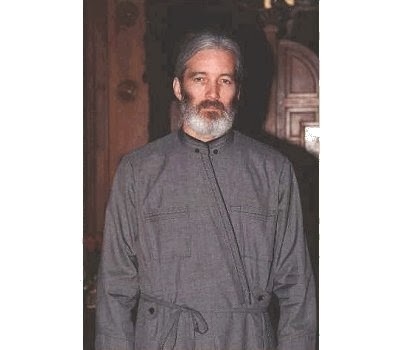 This black outer cassock is said to symbolize the distancing of a clergyman from this world and all worldly things, as well as his dedication to God and the Heavenly Kingdom. 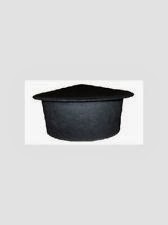 The Kalimafi: kalymavchi (καλυμαύχι) is the iconic black cylindrical hat worn before the Divine Liturgy begins, during some ceremonies and in public as well . It symbolizes self-denial and devotion to the Divine. A bishop will also have a pectoral cross. Not all priests wear one. If they do, it is a bestowed honour. Over his exorason a bishop will wear wears an engolpion an intricate pectoral, elaborately chained, and usually featuring at least a crown and an icon. An important bishop may have two, even more. In this case engolphions act somewhat like a general’s stripes! So even in non-liturgical garb, rank is observed and understood - by those who know. For a long time I wondered how our local priest coped with the heat. Well, for one he sheds the exorason, and by hiking the rason up a bit, he can work in the fields. (in these cases, trousers are worn under the rason). I wondered if he ever went for a swim. He does but at midday when others sleep and usually in a spot with very few people. Exactly what is shed at this point I didn’t ask. It seems contradictory to me that a church which encourages its local priests and deacons to marry, have children, and be part of the community, still insists on this perpetual mark of otherness in everyday life, particularly since in its original form it was the everyday attire of citizens. Remembering that this outfit symbolizes the distancing and death of a clergyman from this world and all worldly things must be hard on a deacon or priest when taking the kids to the supermarket or helping them with their homework. There have been rumblings of protest especially since Greek Orthodox clergy in Europe, America and Australia wear more modern non liturgical outfits and on the street could be mistaken for their Roman Catholic or Protestant counterparts. The dress issue in Greece was highlighted in an article in the New York Times back in 2002. (1) It reported that many of the younger clergy see the rason as cumbersome, and off- putting to potential wives but they must conform “or risk punishment: perhaps a suspension, or a temporary loss of salary”. The article goes on to point out that when Greece’s then Archbishop Christodoulos did propose a discussion of the clerical dress code and grooming expectations, The Holy Synod simply refused to discuss the issue. Change comes hard when consensus is required to alter Orthodox tradition! Father Moulatsiotis, who with other fellow monks is a member of the rock band, Eleftheroi (Freedom or Free Monks) (3) made his statement about modernization by placing a rhinestone cross on his black cap and sporting a black trench coat. His cd cover must have caused quite a stir as well! Some bishops have taken to appearing at meetings in black suits. Nothing much happened nor were fines imposed. I suspect this is simply not an issue that the Church feels it has to tackle right now because the Greek laity is still comfortable with the traditional garb. So, for now, Greek priests stand out in any group of citizens and it still gets them perks such as jumping to the front of most queues, but it also makes them the center of a game played by children (and adults) everywhere in Greece. When a rason is spotted, the person who did the spotting taps a companion on the shoulder and says “parte to papa” take the priest – as if passing on a small piece of bad luck. The person tapped will immediately seek someone to tap in the same manner and say…. Of course, as the rason wearer comes into real proximity the game can immediately cease and the priest’s ring be kissed with utter sincerity. (2) Try http://www.johnsanidopoulos.com/2013/06/the-debate-on-clerical-attire-in-greece.html for an interesting debate on the subject of clerical dress.